The Scutari, by contrast to the Caetrati was carrying the "scuta", a Latin name used for the oblong shield, a "long" shield very similar to the Celtic flat shield, rather than the curved Italic shield. They were either spearmen, swordsmen, more rarely skirmishers (picture) due to the weight of the shield compared to more nimble scutari. The Scuta was made of three planks joined together by a large metal boss and wings strapped around the central spine and nailed to the extremities. It is thought it was bring in Iberia by the Celts and largely adopted by most tribes as it provided a better protection. It is also perhaps the traduction of a shift towards a small-scale guerilla war made of skirmishes and ambushes, towards large-scale picth battles with warriors in mass, advancing in formations and using turtles and shieldwall tactics, like the Celts. 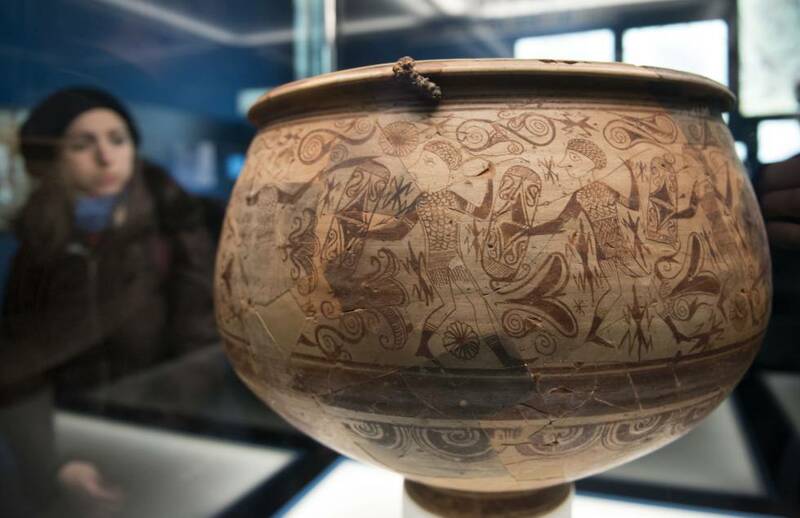 Due to the nature of the Scuta bearer or "scutari", it is more likely this kind of warrior was making close, large formations, second line to caetrati that acted more like skirmishers. 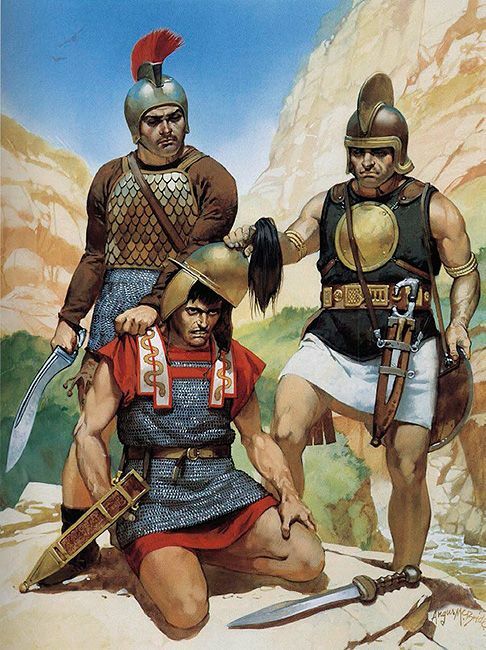 It is quite possible however the Scutari was using a full warrior panoply included helmet, hasta (2 meters lance) one of two lighter javelins or both replaced by a single falarica or soliferum, alternative to the spear, a sword, either falcata or gladius, and knife. The Falarica had a long (90 cm) thin iron head attached to a wooden shaft, whereas the Sliferrum replaced the wooden part and was entirely in metal (see below). The second aspect was the "Devotio". This was less about the warfare level of the infantryman than its affiliation as a warrior in the social order of the day. The english word "Devotion" came from far away in history and the Latin "devotio", well described by Livy and several authors about a practice of Roman generals in desperate situations. Livy's case was about the self-sacrifice of Decius Mus, fighting against the Latins in 340 BC. It was about sacrificing his own life in battle along with the enemy to chthonic gods in exchange for a victory. The same was widespread among the Celts but survived as a watered-down tradition as far as the late Roman Empire by Constantin before converting to Christianism, or the Frankish warlord Clovis for the same reasons and in the same context in his fight against the Alamans. But the term "devotio" was also used also to describe trusted warriors using a similar vow to fight to the last breath, in front of the gods. Hannibal employed as described by Polybius a small contingent of Cantabrian foot warriors, part of his Iberian troops. They made a a loyalty sacred pact before the gods, and after a ceremony, called a 'devotio iberica'. Their leader was Laro, a cantabrian giant of a man, feared with his bipenne axe. The warrior depicted here is rather like a lorica scutari. The lorica is latin for the scale armor, up to their helmets, as seemingly shown by the vase paintings. They had also long sleeves which was unusual. 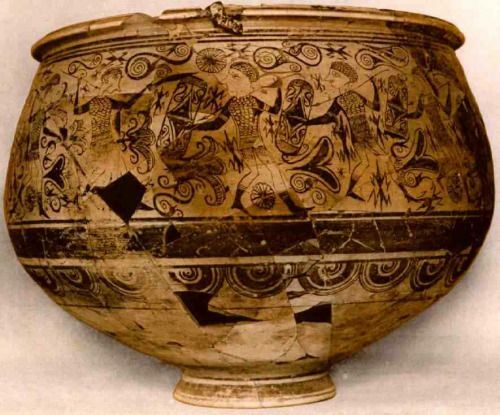 However the celtic patterns and symbols clearly shows Celtiberians. It coould have been a misindentification of a chainmail and painted arms, for any reason, or additional leather sleeves and forearm armbands. 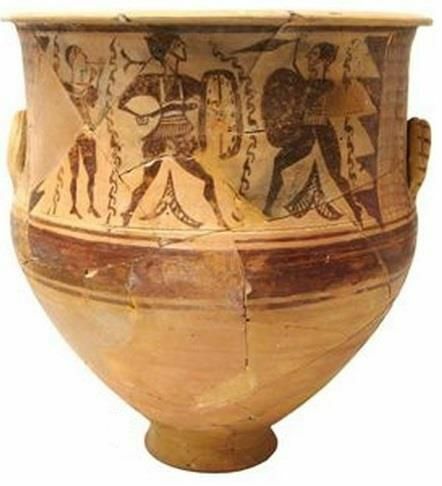 Celtiberian Devotio infantry, as rendered from vase paintings. Loricati scutari (unknown author) showing a bronze crested helmet, and the "apron" over a possibly leather skirt with fringes. This apron was possibly an Iberian equivalent of the Greek pteruges, protecting the groin and underbelly while allowing flexibility. 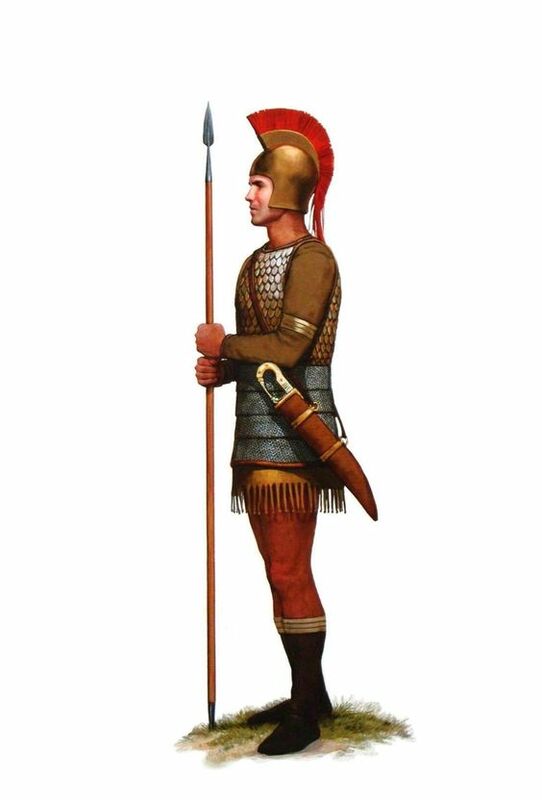 The spear depicted here is a standard hasta, two-meters wooden shaft tipped with a small iron spearpoint, but the Devotio warriors ad loricati, elit warriors of the Iberian and Celtiberians were known for their use of the deadly Soliferum: An heavy all-iron javelin which was perhaps derived from the Gallic Gaballa, and was later adopted by the Romans in their final version of the famous Pilum. It is quite possible that the soliferum already was designed to bent on impact, after penetrating two interlocked shields, rendering them useless. This was the best measure against shieldwalls in widespread use as a defensive tactic. Another interesting depiction of a loricati scutari, this time by Angus Mc Bride. Notice in his case, the "apron" could be either a top "skirt" held by the belt, but made of chainmail, or a full chainmail armor on which was placed a long sleeve shirt (to avoi the sun baking the chainmail) and a lorica hamata on top. Quite heavy and improbable. It is quite possible however the armor was made of two part, an upper lorica hamata and lower chainmail, for more felxibility, resting on a leather tunic. This warrior is also using a falcata, the emblematic Iberian curved sword, which hitting power was that of an axe, but still able to thrusting.